Beef Meatballs and Mortadella in Creamy Tomato Sauce | What Goes with What? Heat oil in a large heavy pot over medium-high. Add onion, carrot, and celery; season with salt and pepper. Cook, stirring often, until vegetables are soft and translucent, 10–15 minutes. Add tomato paste and cook, stirring, until darkened, about 4 minutes. Stir in tomatoes and cream and bring to a boil. Reduce heat; season with salt and pepper. Simmer while you form the meatballs. Using a fork or your hands, mix beef, mortadella, eggs, breadcrumbs, parsley, oregano, and 1 tsp. salt in a large bowl until evenly combined. Form mixture into 1½”- diameter balls, packing fairly firmly (you should have about 26) . Add meatballs to sauce, cover pot, and simmer until meatballs are cooked through and very tender, 40–45 minutes. Serve topped with a generous amount of Grana Padano. 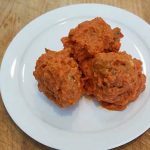 Do Ahead: Meatballs (without cheese) can be made 2 days ahead. Let cool; cover and chill. Reheat gently in sauce before serving.